As you can see, I've been busy playing around with the look of my blog today. What do you think of the three columns? Too busy or looking good? I've found some lovely graphics while I've been trawling the web for ideas and I thought I'd share some of my favourites with you. Can you tell I've got a thing for vintage dolls and kewpies? From a 1923 Needlecraft Magazine. 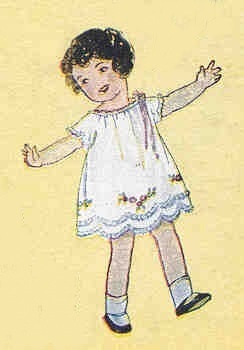 And my favourite, this paper doll from The Graphics Fairy. Isn't adorable? I think I'm going to be printing a few of these off to decoupage some boxes for my girls. Wouldn't they look gorgeous on a t-shirt too? I can feel lots of new projects coming on! 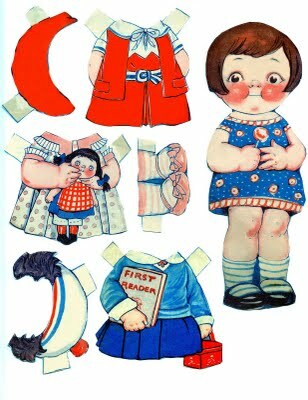 Mmm love paper dolls... actually, I'm mildly obsessed with them! The new look is great! So cute, might have to print out that paper doll one! I like your new look too. like the new look, I keep wavering between liking 2 or 3 columns, because it can get a bit busy...yours looks great!